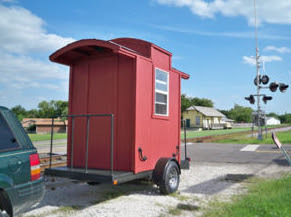 This a lovely idea for the mobile shedworker - it's a handbuilt 5' x 6', two wheel trailer, with front and back porches, tin roof and completely insulated (there's a door at the back and a fake door in the front). It's on sale currently on ebay and here's what the owner says he built it to "take to shows and print photos out of it so I wired it with 110 outlets that you use a on-board extension cord that is in a box under the back. You plug it in and it powers the plugs on the inside. A switch on the inside turns on a 110 volt light." I think there'd be a definite market for this kind of product in the UK (this one was built in Texas). 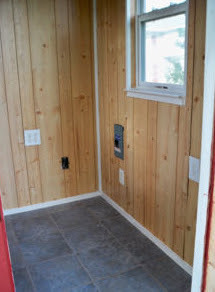 Via Alex at Tiny House Talk and Kent at Tiny House Blog: I like their description of it as a 'hobby house'. Anyone know what this sold for on Ebay?